If you’re a business owner or have a home office, you might be interested to learn about the benefits of using a standing desk as opposed to a traditional sitting one. Let’s take a look at some of the benefits of standing while working rather than sitting all day. 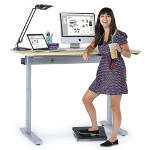 One of the biggest benefits of standing while working is the fact that standing simply takes more energy than sitting. While standing instead of sitting for a few hours definitely won’t erase the need for vigorous exercise, it can help to strengthen muscles that you wouldn’t normally be using and give your metabolism a little boost. When you’re trying to stay healthy, every little bit counts! Sitting all day can result in a number of issues due to slouching and strain on the neck and back. Because standing helps to strengthen the back and core muscles, you can better support your own body weight. That said, it’s important to make sure that your standing posture is good, too, and does not involve too much curvature in the lower spine.